呵呵呵~~ 上周日第一次做湯種, 材料是木薯粉不是高粉,可惜麵糰有點乾, 不夠鬆軟, 體會不到湯種的優點. 也沒啥, 您也不是試了三次才試到最適合的食譜嗎? i used to eat this when I was in junior school! ah i miss those days when i was so naive! So you use the bread machine to prepare the dough and then bake it in oven. My bread machine is different from yours because i can't add yeast directly to the flour mixture. My machine has a yeast dispenser on top of the lid. Also the dough process time takes 2 hr 20 min. Do you think if i can use your method to try this pai bao? Does the process of 2 hr 20 min including proofing and baking? Do you know how long will your breadmaker take in kneading mode? It's full cream milk powder. Thank you for sharing this recipe. I am really interested in trying this out! However, I do have a bread maker. May I know what bread maker you are using? I am considering to purchase one. By the way, do you have any tips on choosing the right bread maker? I would appreciate if you can share your advices. Thanks in advance and God bless you and your family! Thanks for sharing your recipe! I am very interested in trying this out! However, I do not have a bread maker at home. I am considering to buy one though; do you have any tips for me to choose a bread maker that will fit me? I have never used any bread maker before, so perhaps your advice would really help me out! What brand are you using? Can you share it with me, please? By the way, I just googled bread maker and saw this: http://www.google.com/products/catalog?q=bread+machine&oe=utf-8&rls=org.mozilla:en-US:official&client=firefox-a&um=1&ie=UTF-8&cid=318577536350460554&ei=DPjUTL-2N5L0tgP2i7mOCw&sa=X&oi=product_catalog_result&ct=result&resnum=5&ved=0CFIQ8wIwBA#p. What do you think??? I look forward to reading your reply. Thanks in advance, and may God bless you and your family. It look so nice, I can't buy this bread in here. I will try it later when I get all the ingredients first. Can you tell me the milk that you use is cold or warm, because in England is so cold now. And can I use the slightly salted butter, it is melted? Hi Christine, the dough option in my bread machine includes rest, knead and rise and the whole process takes 2hr 20min. The kneading mode takes 15 to 30 min and then rise for 1hr 30min. What do u mean by "proofing"? Use milk in room temperature. For the butter, if it's not too salty, it's fine. Melted butter is ok for breadmaker. "Proofing" is "rest". If you want to shape your dough, you have to turn your dough out after the 1st round of rest after the 30 min kneading. Don't be restricted by the prgramme set by your breadmaker, be flexible. 一個月時間到了, 急忙撈兩個蒸來試吃, 唉, 咸得很, 不知是否我的雞蛋個兒太小了? 是否要減一些醃制的時間, 還是減一點泡浸的時間才好? Thanks for your help, I bought the ingredients today, will make it tomorrow. My breadmaker is the very basic model of Sunbeam. I just use it for kneading. If you just want a breadmaker to do the kneading job, just like me, any reliable breadmaker, basic model, will do. I browsed the link you sent me. That's a Breadman. I haven't used it before, so I can't give you any advice. But one of my friends is using Breadman, although not the same model as yours. She said she's quite happy with her breadmaker. Have been enjoying your recipe. I am also a very lazy person but miss HK food SO MUCH! 1. Anyway, when I was making this, the dough inside my bread machine was so not like a dough, more like a big bowl of paste, is it right? I ended up adding a lot of flour in it so I can work with it after it rise. 2. Also, somehow the outside of my bread always seem to burn. I tried to cook it shorter but worry the inside is not cooked. Coz I cook this for only 20-22 mins. Is that because I am using a cake pan instead of a bread mold pan? 3. Can I add melted butter? I always use softened butter but just wonder coz it's a lot easier to use melted butter. 4. I put some coconut stuff as filling, but had hard time closing it. Would you suggest just use water to close the bread or maybe I just need to learn how to shape bread? 1. If it's like a paste, it's not right. Probably the dry ingredients were measured wrong. You saved your dough by adding a bit of flour, it's a proof. 2. If your bread got burned too quickly, the temperature of your oven might be a bit high. Reduce a little bit next time. 3.Yes, you can. I always use melted butter and it worked every time. 4. The fillings might be too greasy and make it hard to enclose the seam. Damp a bit of water to remove the oil or turn the inside dough out. See how it goes. Thanks for share so many yummy receipes. 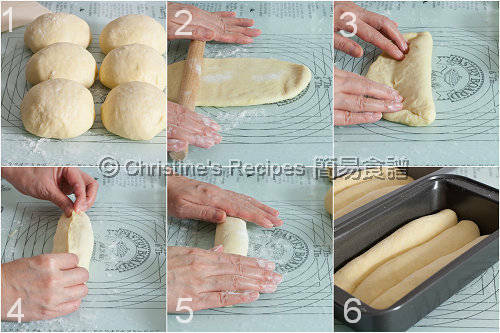 For the 排包做法（2), how to know it is 搞拌至成一麵團, my Panasonic breadmaker's Dough function will automatically do all the steps. Can I stop it halfway to add the butter as you said? When will be the most appropriate time to add the butter? When all the ingredients come together, that it becomes a ball shape, you can add the butter. Normally, I don't stop the breadmaker to add the butter. Just open the lid, and dump it in. What is whipping cream? I bought a whip cream that is in a spray can from the supermarket are they the same? If it's in spray can, it's whipped cream. But whipping cream normally comes in cartoon, in liquid form. I don't see it in the supermarket for whipping cream. Is it heavy cream? If you can't find whipping cream, just skip it. The taste of the bread might have less milky flavour, yet it's still good. For the basic. Which one should I use? Go for the 1.5lb for this recipe then. 謝謝你的分享! 我是新手,　用麵包機整的. 麵團第一次發酵完畢，大兩倍時取出,　但立即成泥漿咁　,後來再加入200G高筋粉(ｂio, type 65)　不知問題出在那裡?? 請指教! 整了一個晚上.至凌晨4點,　終於算是成功了,　還挺軟綿,　但沒有一絲絲的,　正常嗎? 又是我, 我又有問題了, 這次我用了Bread maker, 結果好soft,好開心呀! 不過taste 唔係幾好, 是不是我沒有加奶粉, 我可以放什麼代替呢? Many thanks!! HI..I want to check the dough model for ur bread machine.. How long it takes? Mine one is panasonic machine.It takes 2 hrs 20 mins for a dough mode. Mine is not panasonic. Thought that every breadmaker would be more or less the same. The total time of 2 hrs 20 mins for a dough mode should include the proofing part. Please read your manual carefully before use. It should explain in details. Or else, check and record the time when you make the first dough with it. The butter should be mixed in once all ingredients come together and form a ball shape. Don't add in too late or too early. Too late, the dough won't absorb the butter well, too early, the dough texture is not well formed. Yes, open the cover and add butter. 今天剛做了這個排包，但結果跟某些網友一樣，在麵包機第一次發酵完拿出來時，非常sticky, 不能滾圓，勉強加多些粉，讓它最後發酵，但焗出來很肉酸，而且組織很多洞，不是你照片中的模樣，菠蘿飽也是很多洞，膈天已變硬，想請教是什麼原因？I live in New Zealand, the high grade flour is protein 11.5% is that OK? 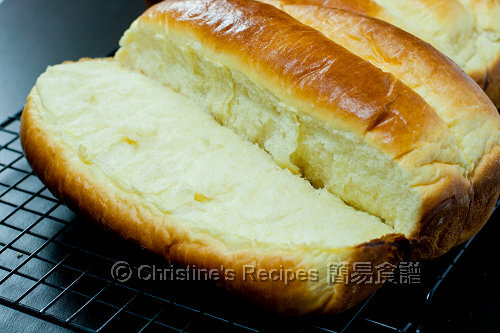 I really want to make this recipe, so its not possible to knead the dough manually? If it's not impossible, it's very difficult to knead by hand, I'm afraid, as the dough is very wet and sticky. Have you tried kneading dough by hand before? If so, you might take on this challenge. I live in N.Z. and here the high grade flour is protein 11.5%, do you know anything I can add to get more protein to become a bread flour? Thanks! If you only can find flour with 11.5% of protein, that's fine. It can make bread. If you'd like more gluten, then you can add a bit of "vital wheat gluten". For this recipe, try adding 2.5 tsp of it. 用 Instant Dry Yeast 啦，方便些，不用預先 activate. P.S. 我全程都是用手做的, 家裡沒有麵包機, 而且是第一次做麵包的呢... 所以說你的食譜真的很捧!!! what is 全蛋液 and what kind of 奶粉? is it specially for cake? 請問選擇麵包機的 "dough" 功能時, 應 set 1 pound or 1.5 pounds before start? 怎樣去衡量呢? Dear Christine, 十分感謝你慷慨分享此食譜, 我昨晚成功照你的食譜做了兩大盤排包! 麵包機是本月初買的, 用了6, 7次, 大部份都是依照你的食譜做不同的麵包! 樂趣真的很多, 又可以和別人分享成品~ 太謝謝你了!! 謝謝 Christine 的慷慨分享, 我是本月初才買了麵包機, 大部分成品都是跟你提供的食譜做的, 做麵包樂趣多, 期待做出更多種類麵包, 跟摯愛分享! 1. My bread maker's dough function has Rest, Knead and Rise, the dough can be shaped after this operation. 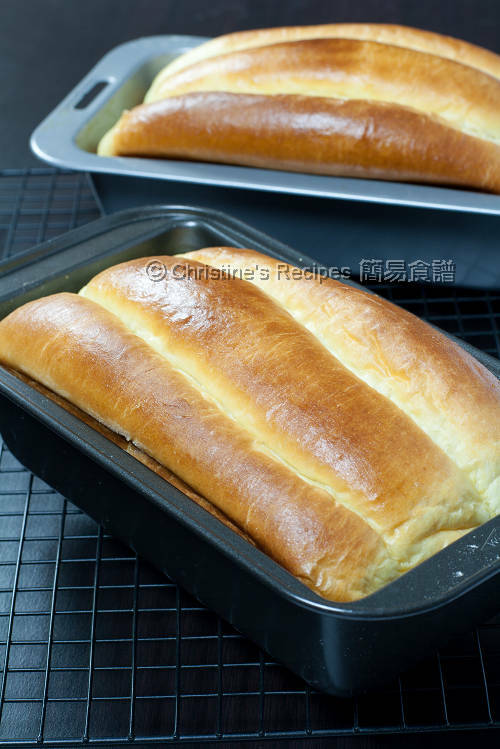 Do I still need to turn out the "Rest" for this PaiBao recipe for better result? 2. When is the better time to add the butter? Half time of doing knead? Hi Christine, how long dose the first round of rise take after the kneading? It all depends on the temperature and weather. Normally, it takes about 40 minutes at 28C. 你好！我今日第一次整呢個pai bao, 用breadmaker 發完一次, 拿出來"猜",好痴手, 點樣可以好似你d 相咁做到咁靚. 我又怕猜個時會落得太多高根粉而影響效果. 而家焗緊, 我聞下隻手, 仍然有好香的奶同包味. 希望今次食得入口.